No need for a special recipe or equipment. It's back to basics here. Dust your work surface with flour before you begin. Keep that flour bucket handy, every now and then you may need a bit more. 1. Pour some flour out and add a few eggs to create a thick consistency. Mash it with your fingers until it is all incorporated. This develops the gluten in the flour, for that lovely "al dente" bite. Let's not talk flabby anymore, okay? Roll it out. I lost my rolling pin, so we used a big thermos. Ghetto fabulous, baby. "Make it work" as Tim Gunn would say. Keep rolling it out, flattening it to about 1/8 inch thickness. In this picture it is still too thick. Need a visual? Thick as a nail file. Once it's super flattened and huge like this, hang it up to "dry". Hang it over a broom (that you have wiped clean first,) and prop it up on two chairs. This allows air to flow through it like pinning clothes on a clothesline. It needs to become semi-dry, but without cracks. She's picture ready all the time, even in the kitchen. The luck! Flip it over and let it dry a bit again. The key is a "leather consistency" here. Enlist somebody to help. After it is ready, (a few hours in most cases, unless you live in the desert,) place it back on the table - after refreshing your table with flour, and cut it into managable rectangles. Then you will roll these rectangles up, and cut them as below demonstrates. Also called "tallarines" in Spanish. Separate it all out and "toss" lightly so that the little stringy bits are not stuck to one another. It will float to the top when it's done cooking. Taste it. Is it al dente yet? Did I mention I LOVE garlic? I sometimes eat it raw, sliced, with cheddar cheese. Yum yum. In my absent mindedness, I forgot to take pictures of the sauteing portion and cooking it in the pan. The following are my "lazy cook" pictures. I threw everything in at once, raw and all, and cooked it on high for 6 hrs. It was fabulous. Allison said to saute the onion and garlic in a bit of olive oil first, until transparent, then brown the beef. Add the wine until it evaporates. Add milk, letting it to evaporate as well. Then add the sieved tomatoes, the bay leaves, herbs, and salt. Simmer for a good hour, over low-ish heat, letting everything mix and absorb the liquids. It will thicken up and turn into a lovely concoction. If you have the time, do it like this. Here's a close up of the sauce. I am forever changed in how I cook pasta. *Instructions courtesy of Allison's familia in Uruguay. A lovely place, rich in tradition and culture, closely linked with Italian customs and cooking. Have a visit if you are able. I do have a pasta maker and have made it, but have gotten lazy lately. 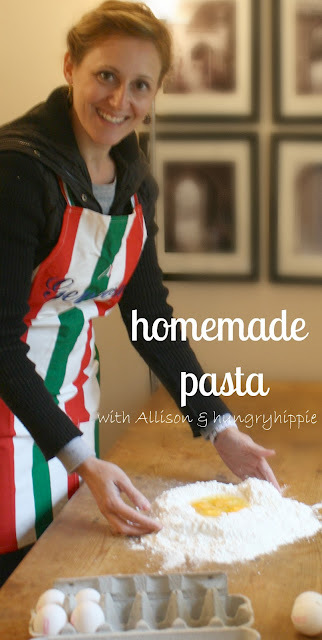 There is nothing like home made pasta noodles, so much more flavor than the store bought packages.